... but that's okay cause the Liars are too! Pretty Little Liars Season 5 Episode 6 may not have been the most exciting (except for that scene towards the end) installment, but it pushed each character into the necessary direction for the rest of the season. A series occasionally has to make a "setting things up" episode to get all the pieces in place. And I'm liking the directions things are going! Pretty Little Liars Photos from "Run, Ali, Run"
Each of the liars has had trouble dealing with Alison's return, as we saw in last week's episode. And now we get to see just how difficult it is for them to escape those old habits and destructive patterns. 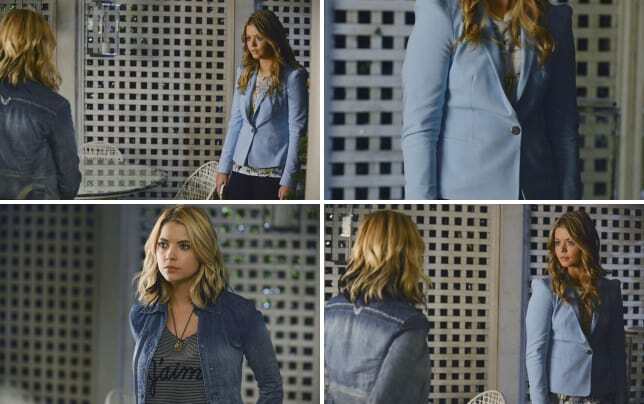 Hanna is the most clear example, as she decides to help Alison leave Rosewood, and ultimately realizes she was only trying to help herself. Caleb points out that Hanna never feels great about herself when Alison is around, but that feeling won't go away just because Alison does. I definitely sympathize with her and I'm thinking everyone's life would be a little better, albeit a little boring, with Ali gone. *Side Note* I can't help but be completely on Team Haleb here. Travis is nice and all, but even when Caleb is being all moody and distant, he still sees Hanna better than anyone else. That's why they work so well as a couple. Here's to hoping he snaps out of his funk soon. Emily fell deep into the mistakes of her past when she started making out with Alison - and she continues her role as Alison's protector this week, fending off an attacker and badgering names out of Paige. But her sleepless night next to Alison indicates that she's grown weary of this role yet again, so maybe change is just around the corner for her. And Aria of course has "slipped" up with Ezra a few times. She knows he did a horrible thing when he betrayed her, but she can't help but miss him and their relationship. It won't be long until they are seriously back together now that they are "working" on those files together and she's being planted in Radley as a spy. I do think it's sad that Aria can't grow past her relationship with this man who lied to her and hit on a girl he knew was both his student and a teenager. Creepy! And if we're being picky, I'm not too happy about the way the Shana reveal is being handled. Just like the Toby reveal and the whole EzrA thing, Shana is yet another red herring. Over and over again, the show sets up certain characters as A... only to retconn or explain away the whole thing. Fans now never fully trust that anyone revealed as A is actually A. It's not that surprising really. I mean, who really thought Aria was right when she said it was finally over? The real A is becoming extremely violent, and I can't wait to find out about Bethany Young and her connection to Alison and possibly A. Clearly, Bethany hated knew Mrs. DiLaurentis from her time at Radley, but it wasn't Bethany who buried Mrs. Di and took a video of the crime to send to Alison. Could it be someone close to Bethany? A did send flowers to the parents of Bethany Young. Does that indicate a connection between them? I'm so ready to find out! Now, the Shana thing hasn't really gone away. Lt. Tanner is back - and, boy, is she asking all the right questions. I've always thought she was the most shrewd of all the police officers paraded through Rosewood (even more so than the corrupt ones). Tanner knows Ezra, Alison and really the other Liars are all hiding something and it won't be long until she finds out something to link Shana's murder to the group. So, is now the time to starting telling the cops the truth? Yes! That's way overdue. No; it's too late to be honest now. Maybe just a little truth.